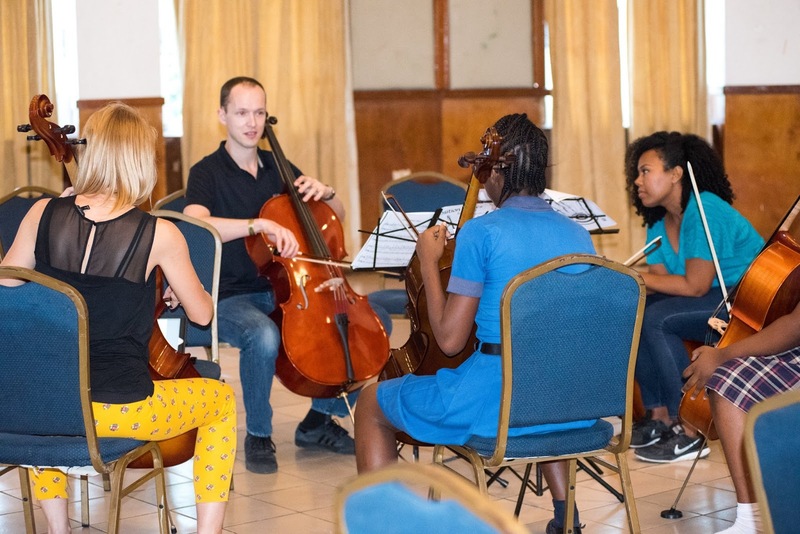 Earlier this month I had the privilege of spending a week visiting the gorgeous island of Antigua and leading a workshop for the musicians of the Antigua and Barbuda Youth Symphony Orchestra. It was a very productive week and the students were incredibly engaged and open to learning! Thanks to ambassador Karen-Mae Hill for the special invitation and to co-leader Zach Buie for lending his time and expertise. I look forward to making more visits in the future to see how this young youth orchestra is developing--the future is bright! Getting technical with the left hand! Transformation from "violin technique" to "cello technique"
Breathtaking views all over the island--over 300 beaches! 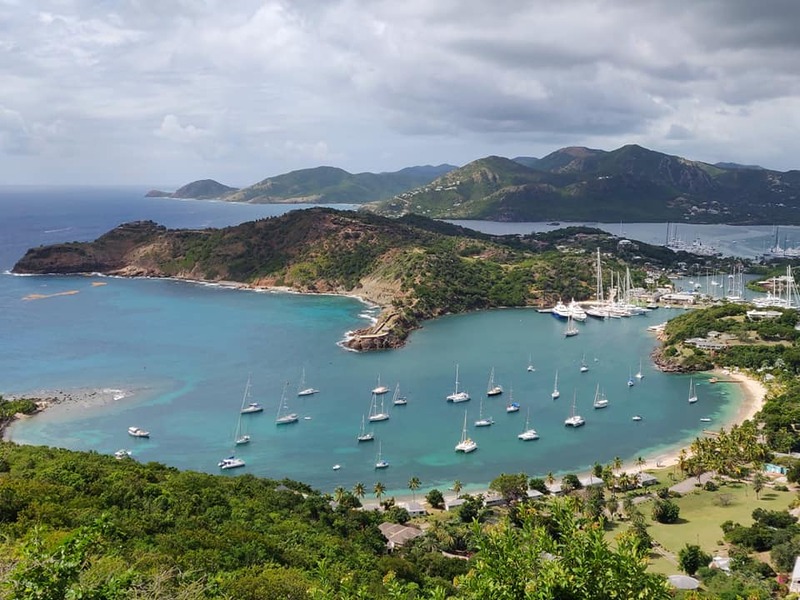 If you are interested in the excited things happening on Antigua, do visit the ABYSO page for updates and more information! I've been trying to get to Kenya for years and I finally made it there this July! I have been slowly building a network of friends, contacts and organizations doing similar work, in East Africa and the pieces finally came together to make my first visit. I spent over three weeks in Nairobi embedded with the Art of Music Foundation Kenya and their sistema-inspired project, Ghetto Classics, teaching cello, conducting the orchestra and leading teacher training workshops with the local teachers. 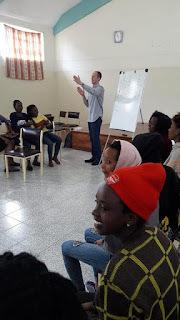 I also worked with several other inspiring social justice organizations including RefuSHE, El Sistema Kenya. 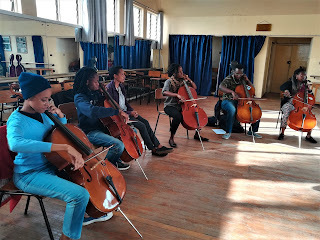 My final days in Nairboi were spent at The Kenya Conservatoire of Music, where I led a cello masterclass and also performed solo with the orchestra. 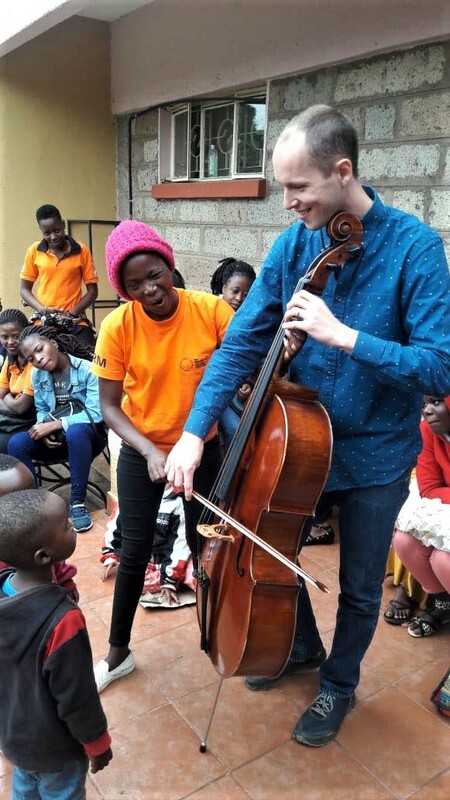 My trip to Kenya was a personal project, but I was also representing MusAid as we continue to look to establish new partnerships and expand our impact! 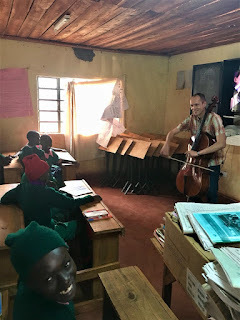 The majority of my time was spent teaching with The Art of Music Foundation, an organization in Nairobi, Kenya, which teaches music to over 300 children in Korogocho – one of Kenya’s biggest slums that is home to about 300,000 urban poor. 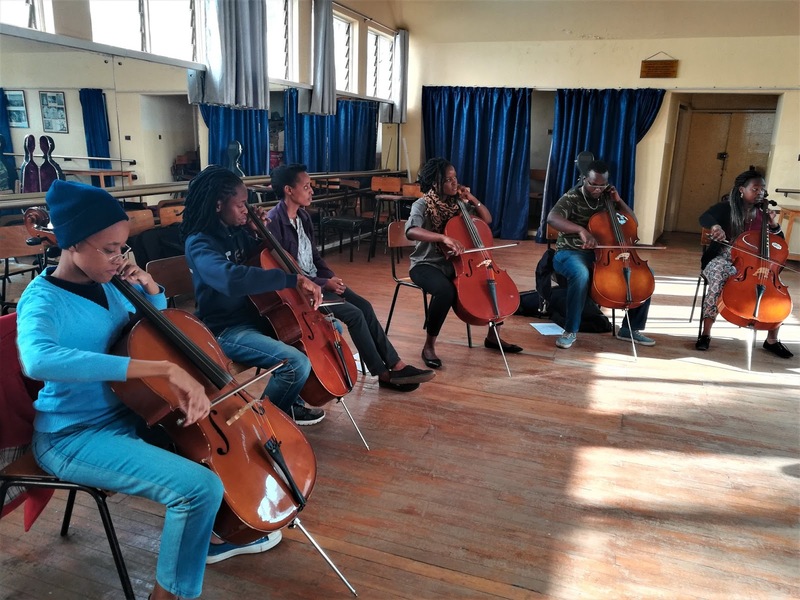 The Art of Music believes that music, with its traditions of structure, discipline and excellence, can offer a great awakening and opportunity to a broad spectrum of Kenyan youth and they see music uniting communities and changing lives. I spent two very fun and inspiring afternoons with the incredible women of RefuSHE--this organization is doing phenomenal work with young refugee women across East Africa. On the first day, we did a lot of body percussion and creative composition activities. 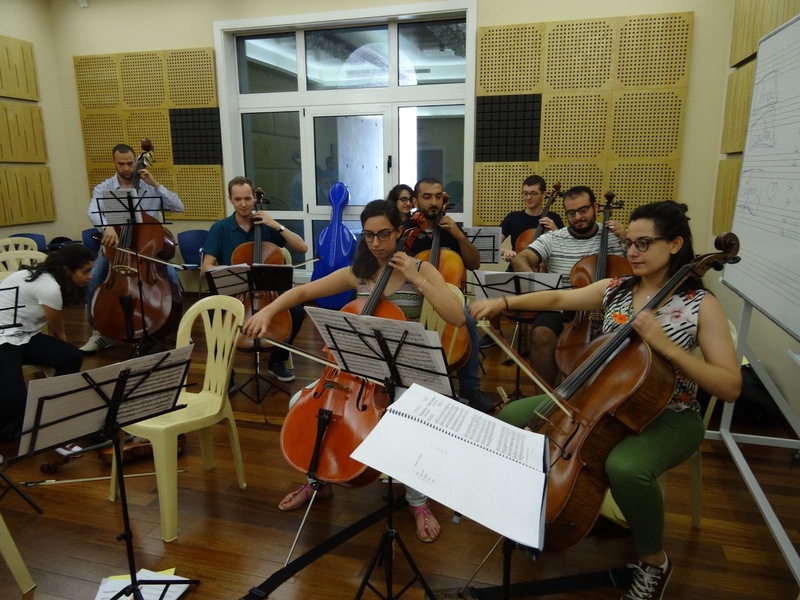 The second day was a cello show-and-tell, which included a rousing sing-along of Despacito. They also shared several songs with me and it gave me chills to hear them raise their voices together in effortless harmony. So that's what it feels like! Another beautiful afternoon was spent with the El Sistema Kenya students at Kawangware Primary School. 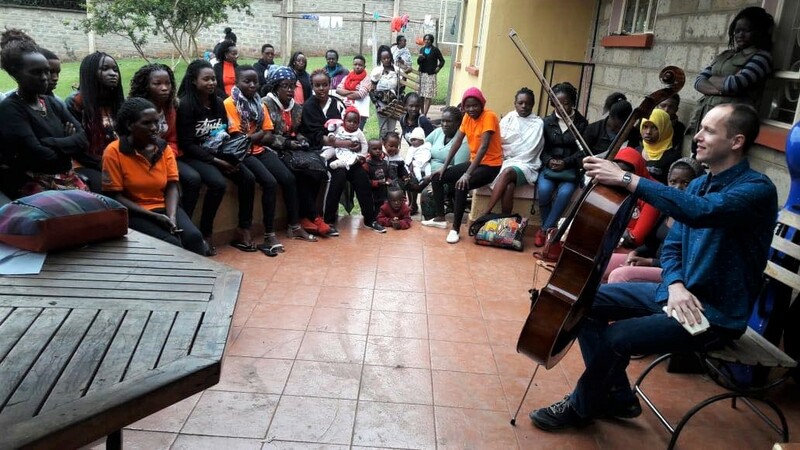 Through their instrumental programs, ESK aims to use classical music to inspire hope and help under-served children in Nairobi achieve lasting change in their lives. 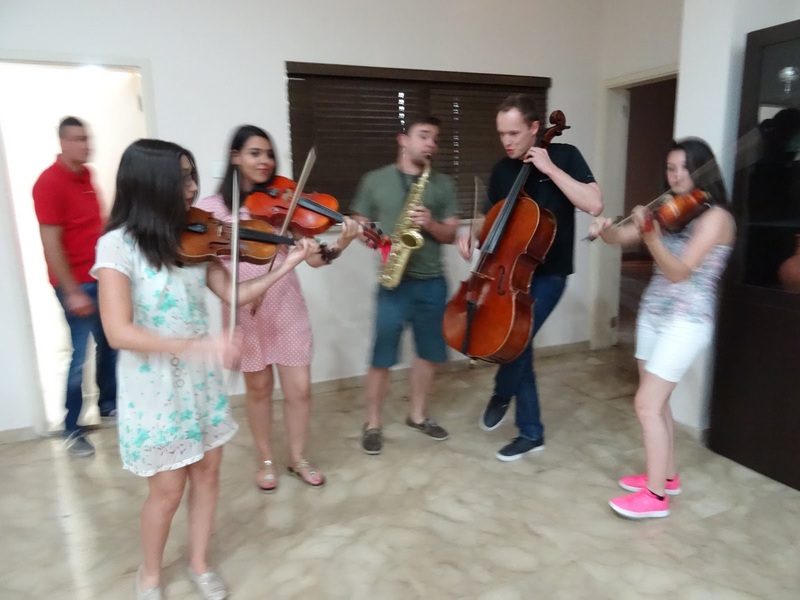 I observed their violin class taught by a visiting instructor and then got a chance to lead a few music games and rhythmic clapping exercises. As I noticed with other programs, the kids jumped into the activities without hesitation or doubt, but full of enthusiasm and joy. One fun afternoon was spent visiting a satellite program on the outskirts of Nairobi. 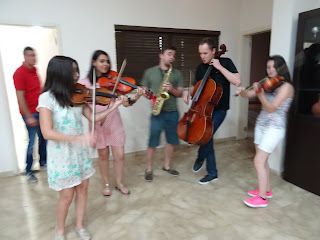 I led some clapping games and did a cello demonstration--many had never seen or heard a cello before and began laughing uncontrollably when I started playing--I guess it is pretty absurd when you think about. It was really nice to get outside of the city for an afternoon and see a different side of Kenya! I also had a chance to experience The Kenya Schools Music Festival, organized by the Ministry of Education. 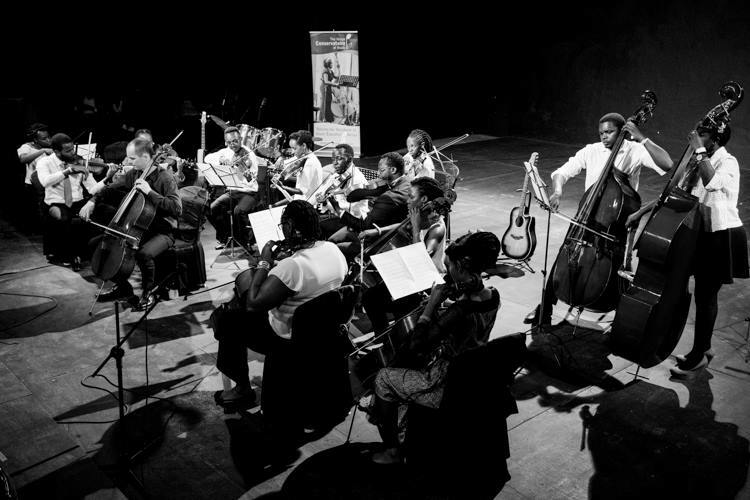 The Festival brings together thousands of students from across Kenya to showcase their musical talents in front of judges, basically like a talent contest of EPIC proportions. Amidst the chaos, a small group of students from the school where I was teaching were practicing an arrangement of a Kenyan popular song! In addition to my teaching, I reserved a few days to take in the abundant spectacular natural beauty that Kenya has to offer. I visited the Giraffe Centre and David Sheldrick Elephant Orphanage and spent one morning at Fairview Estate Coffee farm learning about coffee production and the industry in Kenya. The estate was an experience in itself, complete with dazzling waterfalls, banana orchards and a farm. I also hiked through the beautiful Karura Forest Park and was delighted by the ease of access to stunning nature not more than ten minutes from my hotel! Giraffe Centre close-up, watch out for headbutts! 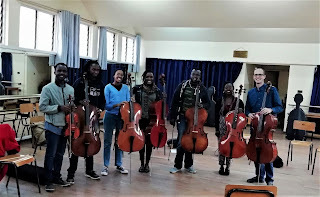 The final chapter of my visit centered around the Kenya Conservatoire of Music. 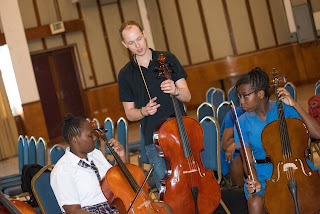 I got to lead a masterclass and I was so inspired by the many talented cellists who performed for the class. Not only did they play beautifully and ask incredibly thoughtful questions, but they patiently listened to, and generously attempted all of my crazy ideas. 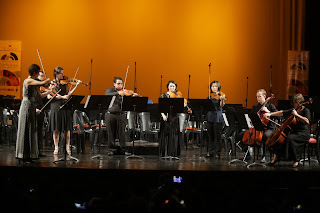 I also had the unique honor of performing solo with the Conservatoire Orchestra for a benefit concert--how special to share the stage with my students! 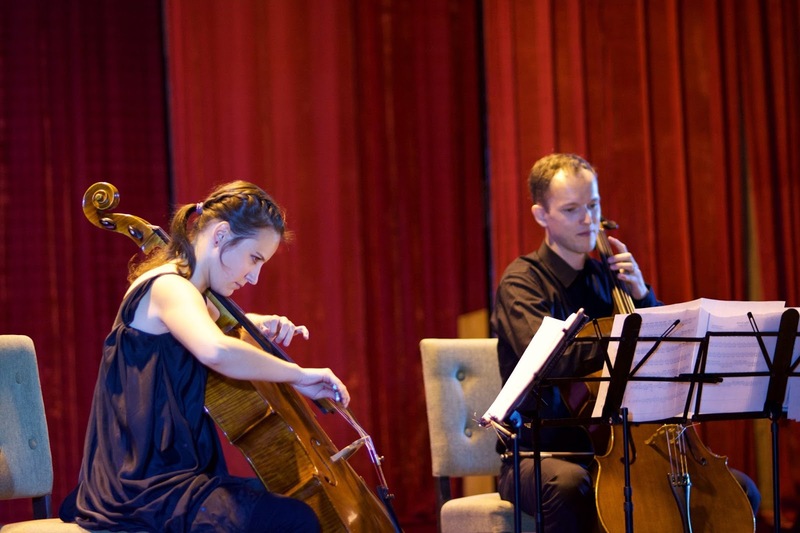 What a talented group of cellists! 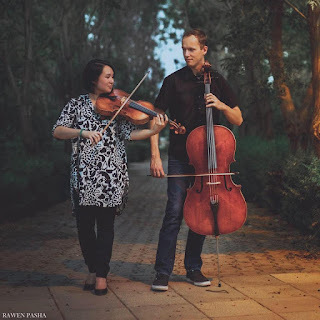 And a final special thank you note to Elinor Gollay for organizing a very successful benefit event and to all of the generous donors who made this project possible. It was an extraordinary trip and I can't wait to return to Kenya again very soon! What a phenomenal closing to a 3-year, 4-visit project with the Turkmen National Conservatory in Ashgabat, Turkmenistan. 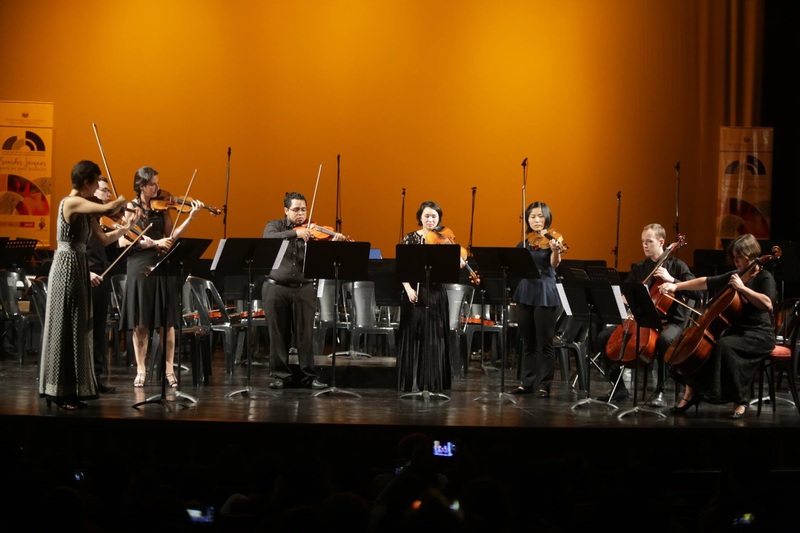 Congratulations to the students on a remarkable final concert! 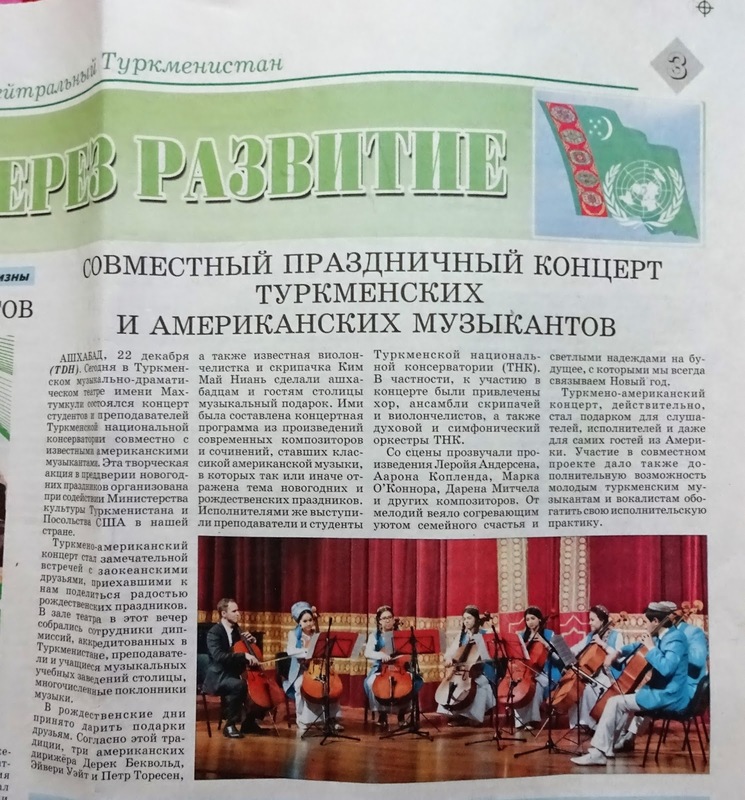 I am profoundly grateful for this experience would like to thank Nargiza Metyakubova and the staff of the U.S. Embassy, Ashgabat, Turkmenistan for their generous support visit after visit. And of course John Ferguson and the American Voices team for believing in this work and for creating this opportunity. 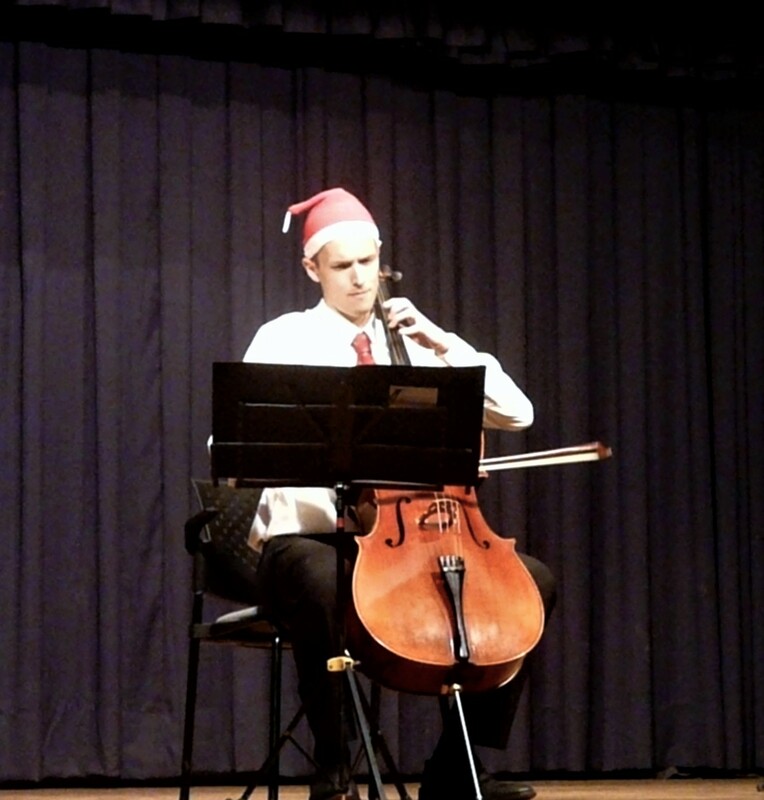 My first performance as a standing cellist! The benefits of this program were numerous and far-ranging. 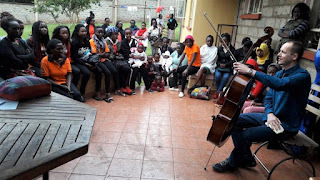 Because it was a multi-stage project, we were able to cultivate meaningful and close relationships with various community members with whom we engaged with, from Conservatory students and American Center public, to local teachers, staff and young professionals associated with the music scene. Through these long-term friendships and partnerships, we were able to convey a huge range of knowledge, expertise, teacher training feedback, and general advice. The students we taught will become the next generation of teachers and performers in Turkmenistan and hopefully what we shared will inspire them be more curious and creative in their artistry! 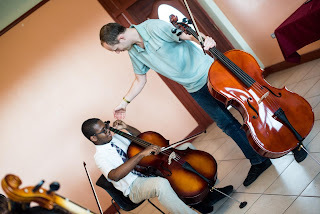 For me, the goal was always to invite the students to learn in a new way. 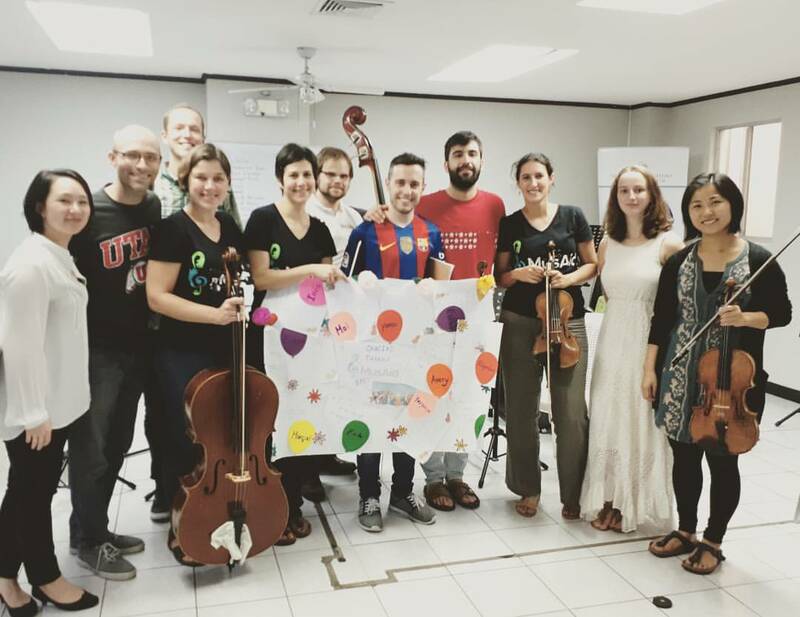 Through playful encouragement and creative collaboration, I tried to shape a non-intimidating learning environment. 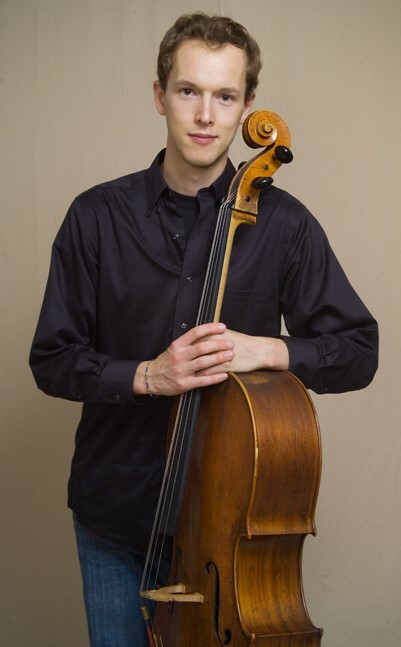 Using the creative flexibility found in American music styles, I pushed the students to explore the uncharted technical landscape of the cello. To my delight, the students really responded to this new creative freedom and I noticed a marked difference in their overall confidence and creative imagination visit after visit. For me, these four visits have been richly rewarding and transformative and the experience of teaching in Turkmenistan specifically really reinforced my belief in the communicative power of music to connect us all as global citizens. 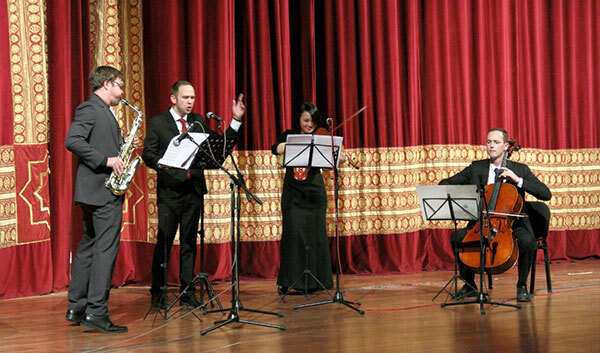 Music is a powerful diplomatic tool in helping to discover and celebrate our similarities. This shared language allows for immediate and deeply-felt communication, a form of communication which may at times succeed when other more conventional forms of diplomacy fall short. 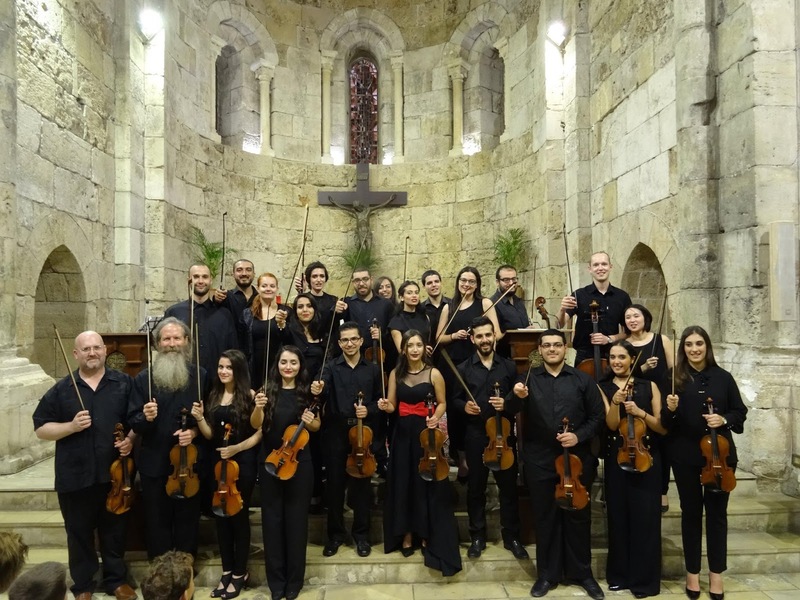 To me, exciting and deeply felt music-making and learning can create the ultimate platform for powerful human connections and meaningful cultural exchange. During my last month in India, I was contacted by Nikhil Sardana, a Mumbai-based journalist and Western Classical music advocate. 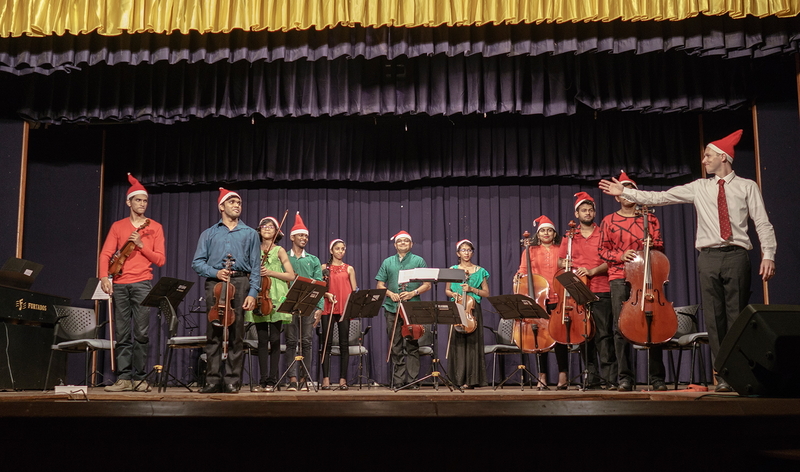 He is deeply invested in helping to transform the Symphony Orchestra of India, now comprised mainly of foreigners, into an ensemble which reflects India and celebrates Indian musicians. His online magazine Serenade, is an excellent resource for industry news stories and other cultural events happening around the country. 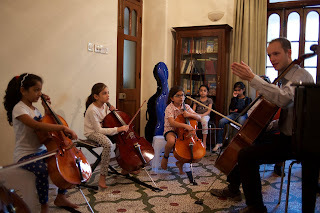 Nikhil was very interested in my work after reading an article entitled "Heal the World" in the Bangalore Mirror about my strings workshop project at the Bangalore School of Music. He asked me to write a piece summarizing my experience as a Fulbright Scholar in India. 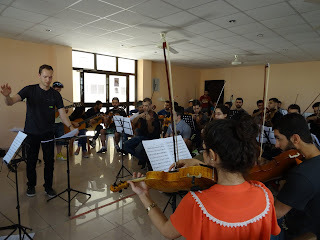 So if you're curious about my year in India, here is the article entitled "Finding my Path: Exploring Music in India as an American Cellist and Educator" which features some great photos and a quick recap of my experiences. 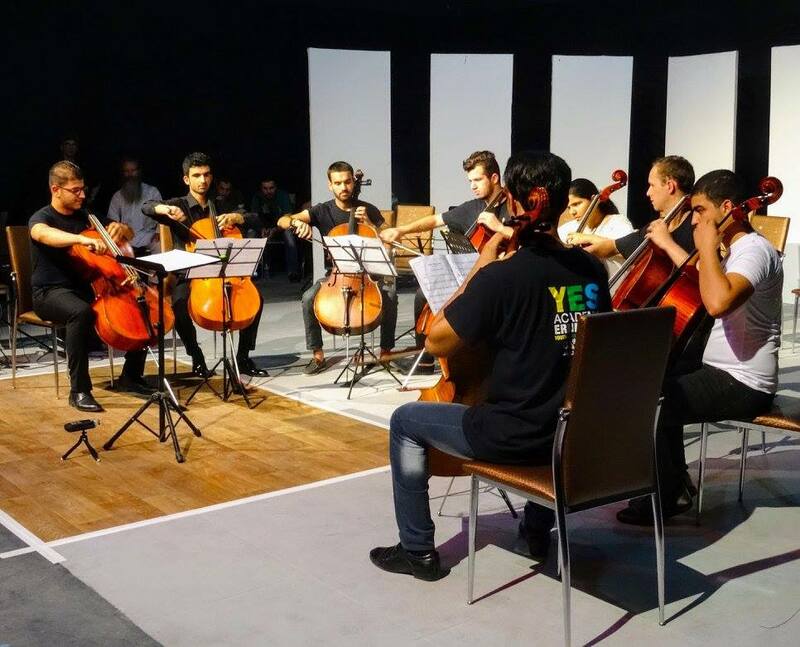 In other news, I recently returned from my third year teaching at the YES Academy programs in Erbil, Kurdistan, and Beirut, Lebanon. I am always moved and amazed by the genuine warmth, generosity, kindness and overall goodness I experience in the Middle East. I feel like students I only see once a year for a few weeks are some of my dearest and most treasured friends. Thanks to my fearless and passionate colleagues, you are all astounding artists and human beings, and to the peerless American Voices staff. YES2018! 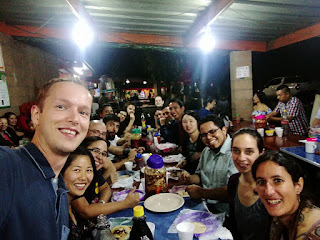 I also had the honor of returning to El Salvador for a third summer as a Program Coordinator with MusAid. 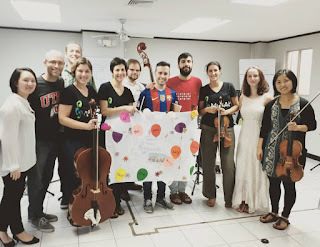 We had an all-star team of eight phenomenal guest teachers from all over the world and it was perhaps the most successful project with El Sistema El Salvador to date! 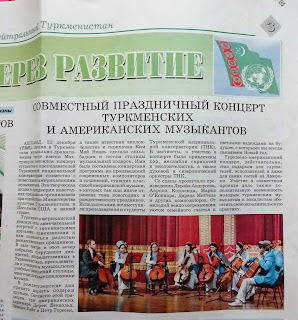 I'm off to Turkmenistan in under a month for my fourth (and final) cultural diplomacy project with the US Embassy and the Turkmen National Conservatory. More news to come! 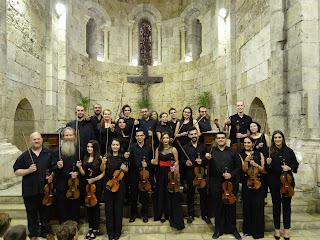 The last month has been a whirlwind of traveling, teaching, performing and unforgettable musical experiences! In late November, I flew to Mumbai, which was my first excursion outside of Delhi since arriving in India. 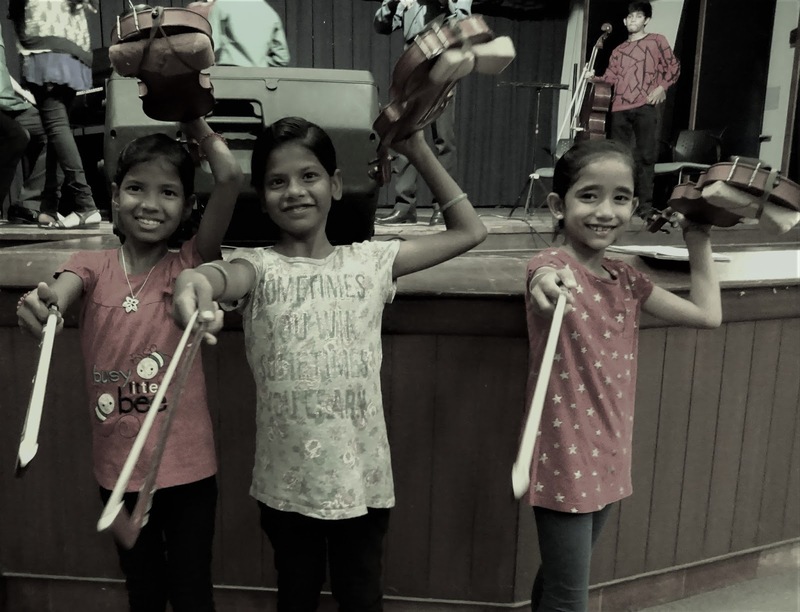 I spent a fantastic week in Mumbai working with the incredible students and faculty at the Mehli Mehta Music Foundation! I was very impressed with the promising young cello students, many of whom had only been playing for one or two years. I also performed a duo concert at the Russian Cultural Centre with Mehli Mehta faculty cellist, Magdalena Sas. 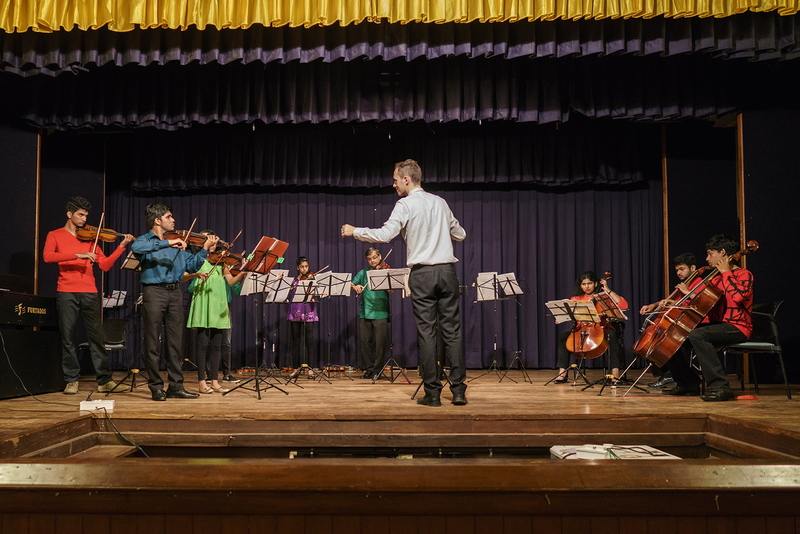 After Mumbai, I had the pleasure of visiting yet another exciting and dynamic music program in India! 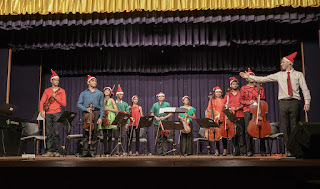 I was so lucky to be able to spend a week in Goa helping the talented and hard-working students of Child's Play (India) Foundation prepare for their big Christmas show! Congratulations to all on a spectacular performance! After a few days of rest, I flew off to Turkmenistan for my third visit! It's hard to put into words how moving, inspiring and transformational this past week in Ashgabat was for everyone involved in this phenomenal project. 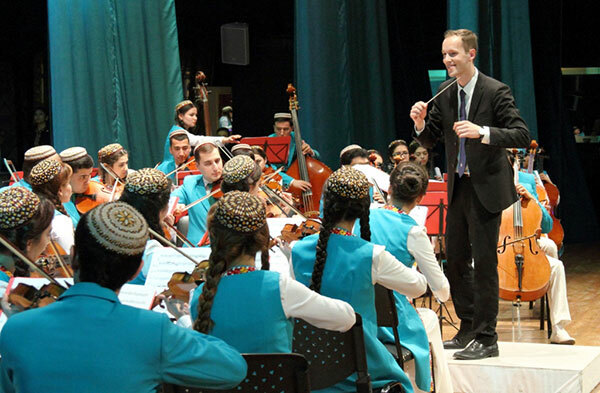 The students at the Turkmen National Conservatory really stepped it up for the final concert, playing and singing with heartfelt abandon! 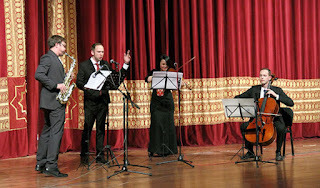 Thanks to Derek, Peter and Mai for being incredible colleagues and musical collaborators and to the U.S. Embassy staff for 10 days (+ many months) of tireless work and generous friendship. Thank you for your commitment to cultural exchange as a powerful vehicle for diplomacy. As ever, thanks to John and American Voices for continuing to create these remarkable, life-changing opportunities. 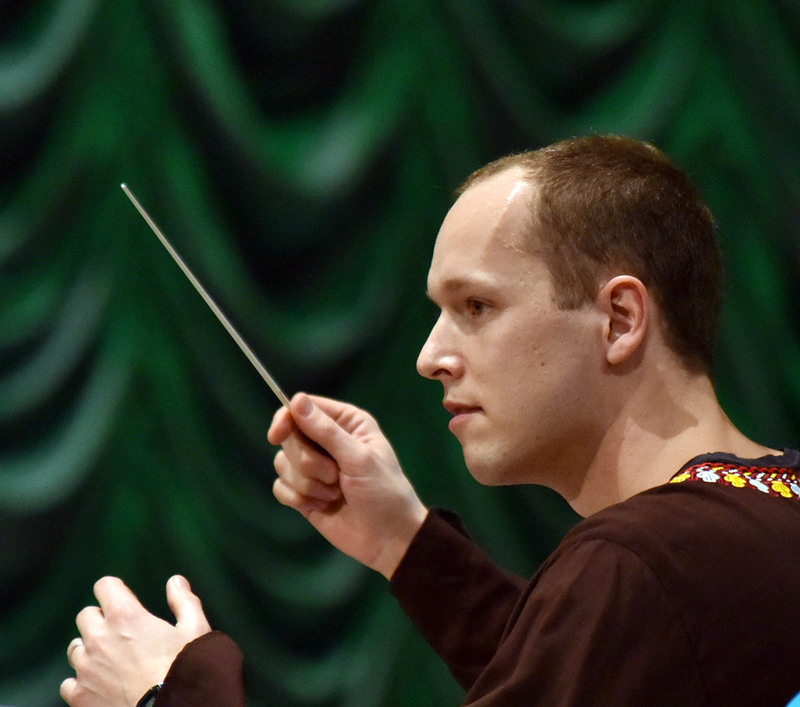 Conducting Blue Rondo a la "Turkmen"
I'm already looking forward to my next project! I'll be flying to Kolkata in few weeks to conduct a week-long intensive workshop with the Calcutta School of Music Chamber String Orchestra focusing on works by American composers, which will feature traditional music styles like Jazz and Bluegrass. This is what it's all about!